Launching a website nowadays is not that big deal. Previously it was a prerogative of coding gurus and web designers only. However, the introduction of ready-made templates enables anyone irrespective of the skills and experience to launch a fully-functional website. The choice of the templates in the market is really enormous. It is presented by different CMS and everyone can choose what he likes most. The beginners usually start with WordPress as it is the most intuitive and user-friendly platform. Advanced users opt for HTML templates. Basically, there are no good or bad choices when it comes to CMS. However, if you don’t have any preferences, you will have to study the issue. Each platform has its strong and weak points, which makes it more or less suitable for this or that purpose. We have chosen 10 multipurpose templates of different business niches to help you to create a decent representation of your business. 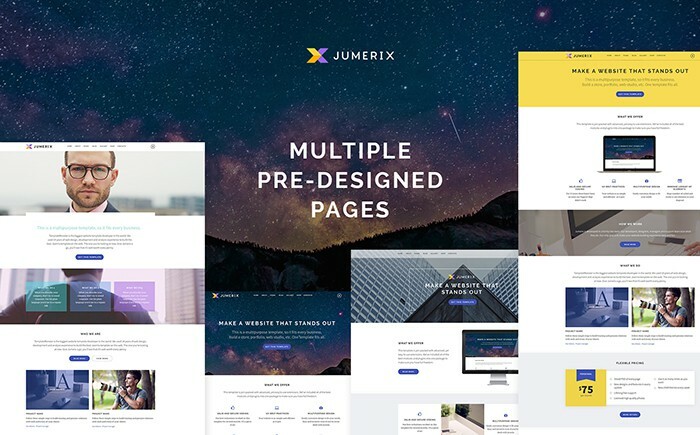 Multipurpose themes are getting more and more popular today. And there is a good reason for that. They can give an easy start for any business, as they come pre-packed with everything you might need. They are like construction kits: there are lots of details, but you pick up only those you need for your model. Multipurpose templates boast a versatile design and advanced functionality, which make them suitable for almost any type of project. Still, this fact has the reverse side of the coin as well. Being pre-packed with so many features, half of which you might never need, the themes can be quite heavy. Plus because of these extra features, there is always a possibility of conflicts, when you will try to add some functionality to your website in future. That is why professionals usually prefer niche templates with focused specialization. However, if you are just starting and don’t really know what you might need, multipurpose templates are ideal for you. 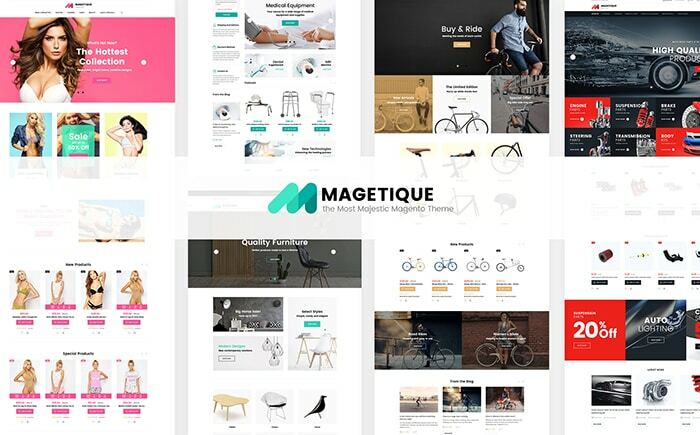 I have picked out 10 multipurpose templates from the collection of the world’s leading template provider, TemplateMonster. The company is in the market for more than 15 years, which guarantees a high level of professionalism and experience. The themes are created with clean valid code and in respect of all the latest trends and web design tendencies. The themes are aimed at the beginners, so the customization process is simplified and the contact with the code is minimized. You can modify your theme in the visual mode by simply dragging and dropping its elements. All the templates are cross-browser compatible and SEO-friendly. The fully responsive design makes your website adaptive to the screens of any sizes. Moreover, buying any TemplateMonster product you get lifetime access to the free 24/7 support. 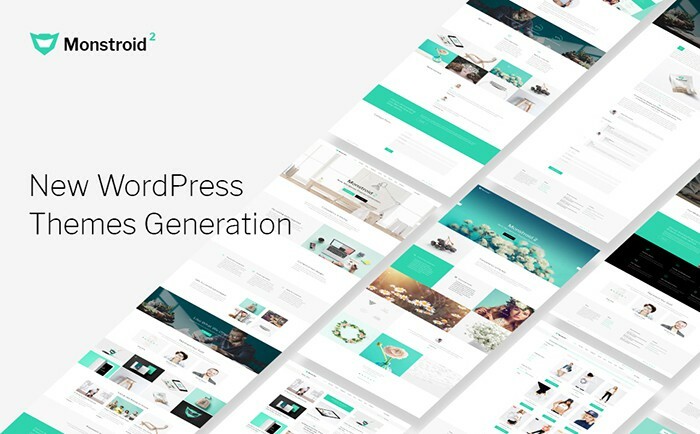 Monstroid2 is the most powerful multipurpose WordPress theme so far. It is licensed under GPL v3.0, which gives you the right to use it for unlimited number of projects. 10 pre-built websites enhance you opportunities. You can fully customize the template and personalize it to fit your particular project. Multiple plugins make the template that powerful that you could never imagine. WooCommerce integration and pre-design eCommerce pages make it easy to launch a store. 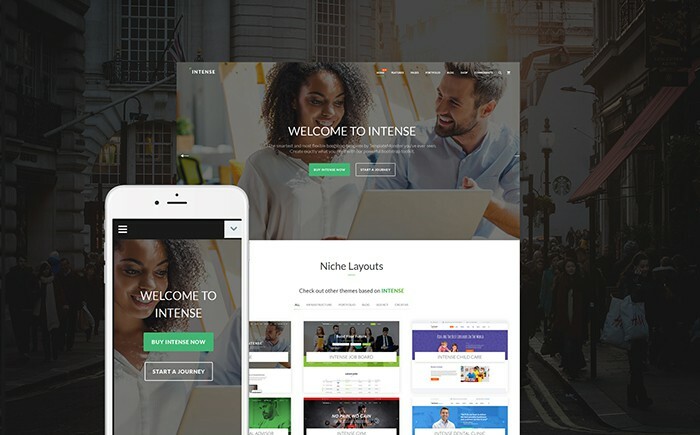 Intense is the most complex HTML5 template ever. 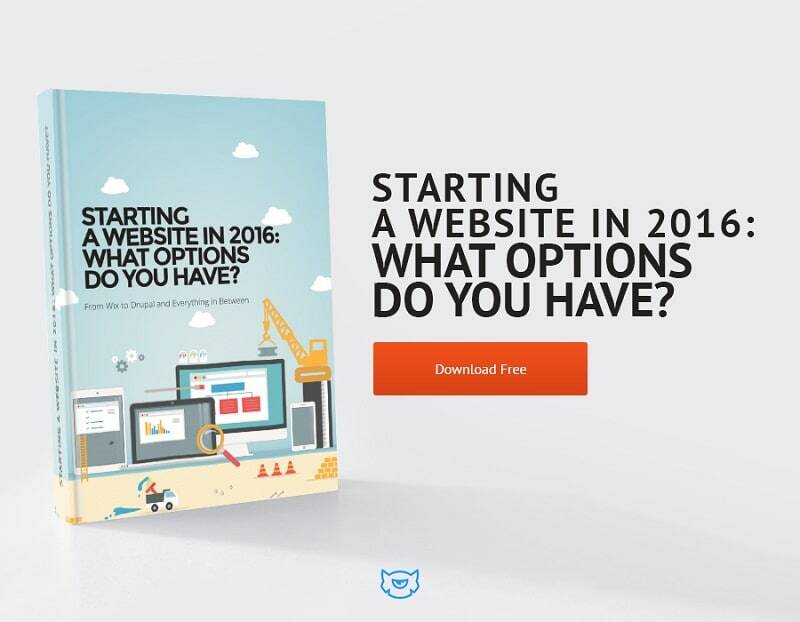 It comes with 450+ pre-designed pages, 18+ niche templates, advanced UI kit. Any get all this in 18 different skins. You have loads of possibilities for customization. For advanced modifications there are 300+ sliced layered PSD files included into the package. The theme is responsive and retina ready. 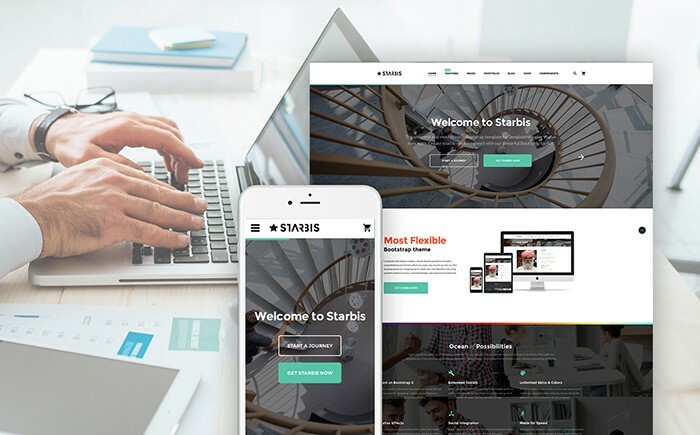 Starbis is a professional multipurpose website template equipped with an innovative Novi Builder. It is a powerful customization module that allows you modifying your website in WYSIWYG mode. Buying Starbis you get access to 6 niche templates you may use for your project. 100+ HTML files, including eCommerce shop templates allow you starting a fully functional website out of the box. 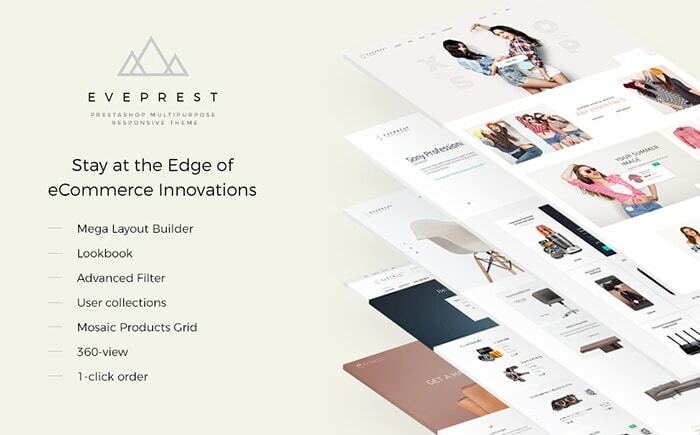 Eveprest is an ideal eCommerce solution for your online store. It comes with 10 niche templates for any purpose and 10+ premium modules, which are going to save you $1300! They include TM Collection, TM Advanced filter, TM Lookbook, TM Product manager, TM 1-click order, TM 360-view, and many others. TM Mega Layout provides you with an easy customization process. The set of premium features the template is equipped with allow you managing your store effortlessly and without any difficulties. Its sleek modern design does not only look appealing, but is thought-out and aims to convert. You can choose between 5 topic layouts: for car spare parts, lingerie, furniture, bikes and spare parts, and medical equipment. 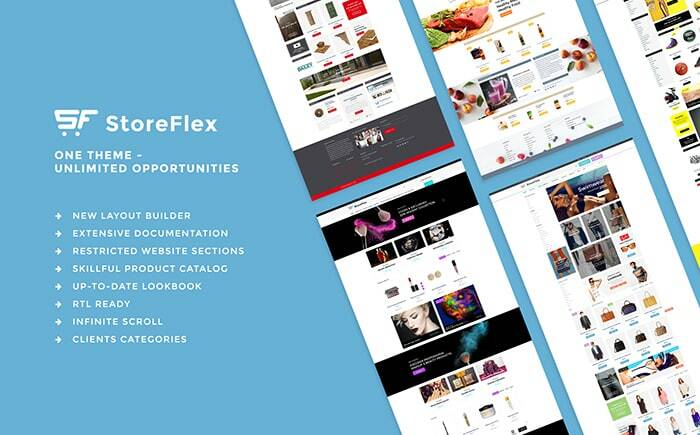 StoreFlex is a rock-solid foundation for your online store. Multiple skins make it easy to find a perfect fit for your project. With the help of Lookbook product presentation allows you organizing the items into original images with hotspots. The theme comes multilingual with RTL support and also supports different currencies, which will help you to expend your business to the international market. Jumerix is a multifunctional solution for any project. Virtuemart integration allows you starting a fully-fledged store. The template comes with multiple pre-designed pages, different variations of the home page and various blog layouts. YouTube video integration can become a real conversion booster for your website. You can also make use of the forum functionality. Modicate is a modern HTML5 template with powerful functionality. It is fully responsive, enhanced with Bootstrap features. 55+ ready-made pages make the template suitable for complex projects. ECommerce pages are also included into the package. Multiple gallery types ,6 layout options and loads of customization options allow you personalizing your theme and adjust it to your needs. MotoCMS templates are the most intuitive in the market. Powerful Moto website builder makes it easy to build your own website from scratch. It comes with 6 child pages that were designed to meet your business requirements more specifically. The theme allows you launching a fully-functional blog section. There are also lots of trendy features in the package. This template combines top-notch design and advanced functionality. 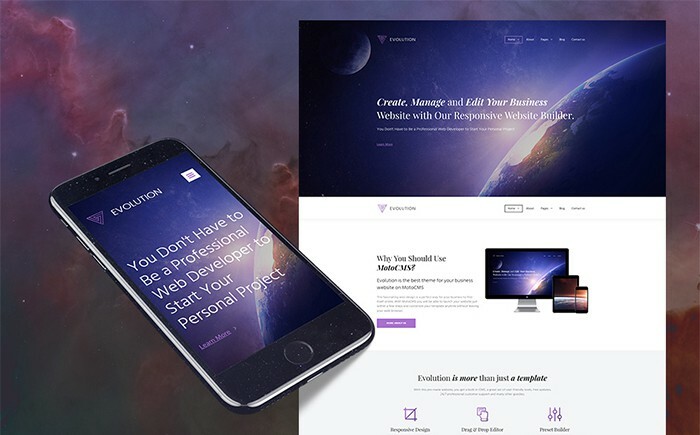 The responsive layout is built with Bootstrap 3.3. Rich UI kit allows you diversifying your website with multiple content types. Parallax scrolling adds dynamics to your layout. The template has integrated live chat module that will help you to provide your clients with the first-class support. If you are planning to launch and maintain your website by your own forces you might need a solid background. Luckily, there are lots of free online sources where you can find all the information needed. I recommend you to start with Startup Hub. There you will find tons of useful information in the form of tutorials, eBooks, articles and webinars. And here is a small bonus – an absolutely free eBook that you can download right away. Nice collection of themes shared here. I am using MyThemeShop themes but I think I should try TemplateMonster themes especially for my Client’s websites. 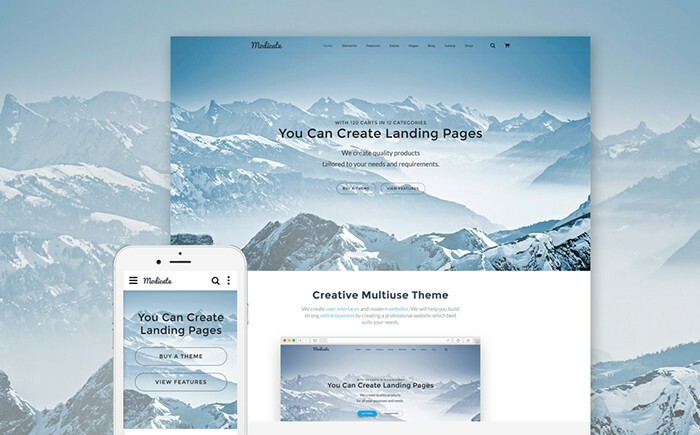 Thanks for sharing this collection of multipurpose themes. 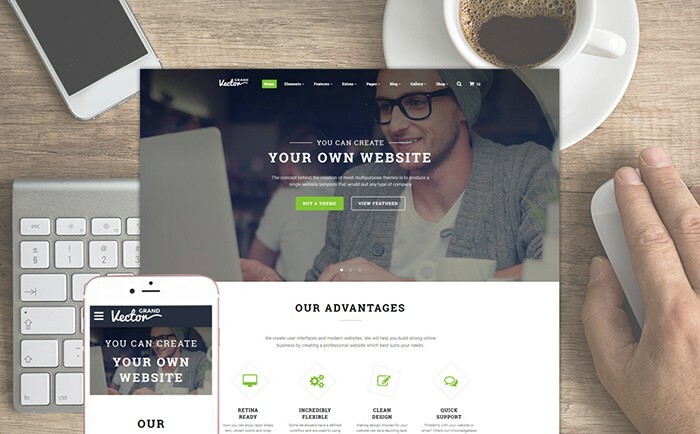 Thanks for checking my collection of multipurpose business TemplateMonster themes, Kuldeep. Multipurpose website templates make it possible for you to create any kind of website that you can imagine. You can use them for publishing your personal blogging site, portfolio, corporate website and eCommerce site. The multipurpose WordPress themes are finding their way in all types of industries. People use them for personal blogs, for promoting their businesses, for selling products, for creating their portfolios and much more. The different layouts are allowing to customize the theme just the way you want. A great thing is that the multipurpose WordPress themes are totally responsive to all types of devices. No matter if you will use them on a tablet, laptop or mobile device, you will always be provided with the highest quality. Eventually, thanks for exploring these valuable services and hope surely very helpful for people in competitive era. Thanks for commenting and sharing the post, Amar. We have tried Evolution template on a client project and found it to be working perfect. It looks modern and works all well on mobiles and desktop. Thanks for sharing your experience with TemplateMonster, Vibha. Very good article and nice collection for multipurpose themes.